HOUSTON, TX--(Marketwired - Mar 24, 2014) - Industrial Pipe Fittings, LLC, a Plasson company that manufactures the most complete line of HDPE pipe fittings, Electrofusion, and large diameter HDPE pipe in the western hemisphere, recently outfitted their fourth 316(b) fish sustainability project in the metropolitan New York area, this time at a power plant in New York City through their local partner, CPE. Section 316(b) of the Clean Water Act mandates that the location, construction, design, and capacity of cooling water intake structures for power generating facilities be up-to-date with the latest technology to minimize environmental impact. To adhere to these regulations, the New York City power plant enlisted the help of MVN Associates, a project design, management and implementation company based in Elizabeth, New Jersey, and their subcontractor, CPE. The project required piping and fittings that were strong and durable yet flexible and lightweight for efficient and quick installation. As the leading manufacturer of HDPE fittings, IPF-Plasson was able to supply the right material, on-site technical expertise from Peter Jenkins of IPF-Plasson and CPE's engineering services to meet project demands. Electrofusion was chosen as the method to join the fittings and pipe due to the space and time constraints. Weather became a factor at the time of installation, but CPE's project assistance was able to overcome the cold and snow that took place at the time of installation. "Not only did IPF-Plasson's ElectroFusion fittings meet the rigorous project demands, but IPF-Plasson's accessories like our state of the art scraper, increased the accuracy and speed of the installation," explained Peter Jenkins. The project involved mechanical work to upgrade traveling screens in the screen house that would prevent fish from swimming or being drawn into an aqueduct or cooling water intake as well as collaboration between MVN's dock builders and CPE to install HDPE piping into a vault excavated in a concrete relieving platform at the bulkhead. The pipe penetrates the pier elbowing at the bulkhead and, anchored to the bulkhead wall, runs parallel to the river for 230 feet to return fish from the newly installed traveling screens back to the river. Working alongside MVN and CPE, IPF-Plasson has supplied HDPE fittings on four other 316(b) projects in the metropolitan New York area over the last three years. The company prides itself on delivering the highest quality pipe fittings. As the leaders in solution based pipe fittings in their industry, IPF-Plasson provides customers with competitive priced solutions with the local support of their partners. To learn more about IPF-Plasson and their complete line of HDPE pipe and fittings, visit them on the web at http://ipf-plasson.com/ or call toll free at: 800-241-4175. 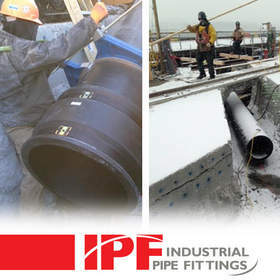 IPF-Plasson's electrofusion pipe fittings withstand the extreme weather conditions during installation in New York, NY.